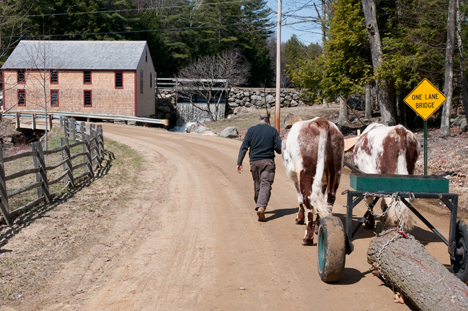 Tim Huppe, farm manager at Sanborn Mills Farm in Loudon, N.H., driving a team of oxen as they haul lumber. The New York Times ran an article last week about a rising interest in using animal power on small farms as an alternative to gas-powered machinery. 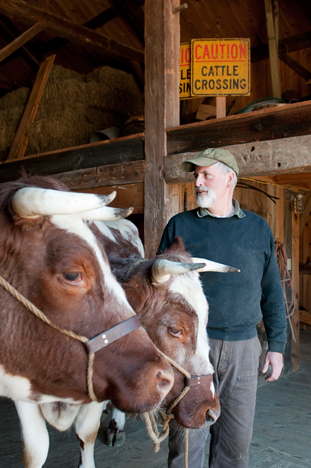 I had the pleasure of photographing two oxen experts on a farm in central New Hampshire for this piece. 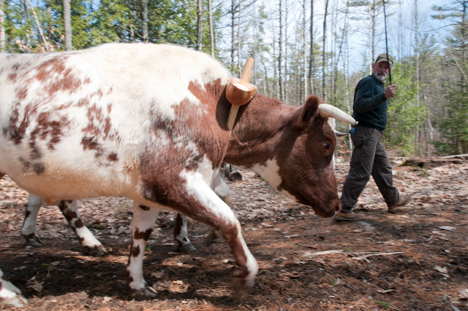 Tim Huppe, farm manager at Sanborn Mills Farm, and Drew Conroy, professor of applied animals sciences at the University of New Hampshire, demonstrated for me how well-trained oxen can haul lumber and plow fields. Tim has spent years training Joe and Jake, and other teams like them, including one that was used in the John Adams miniseries. 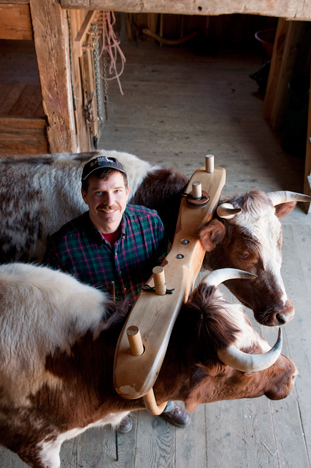 Drew Conroy wrote the definitive guide to working with oxen. I thoroughly enjoyed learning about these incredible creatures, who, despite weighing a ton (literally!) and sporting some seriously pointy horns, were as gentle as could be. Okay, so the fact that they’re castrated may have just a little something to do with that. Did you know that an ox is simply any castrated bovine that is used in a work capacity? I didn’t. Other interesting oxen facts I learned on the bright, warm April day that I visited the picturesque farm included that oxen who are injured while they are growing get what are called misery rings in their horns. One of the oxen at the farm, Joe, has a circular mark on each horn due to a problem he had with his leg when he was younger. I also learned that oxen who work in teams for several years form an unusually close bond with each other, to the extent that if one dies or needs to be euthanized for some reason, it is often more humane to put the other one down at the same time. 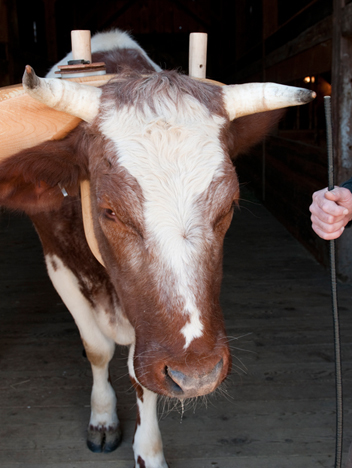 "Misery rings" on an ox's horns indicate a past injury. Tim was kind enough to let me try my hand at “driving” the oxen, which basically involves saying “gee,” “haw,” “whoa” and other universally used commands while raising or lowering a stick. This team was so well trained that I think they would have walked all the way back to Maine with me if I’d asked them to. While that was tempting given the short work they could make of overturning my garden beds, I decided they’d be happier on their 350-acre idyllic estate. The boys, doing what they do best. This entry was posted in The New York Times and tagged Drew Conroy, oxen, Sanborn Mills Farm, Tim Huppe on May 8, 2011 by Stacey Cramp.